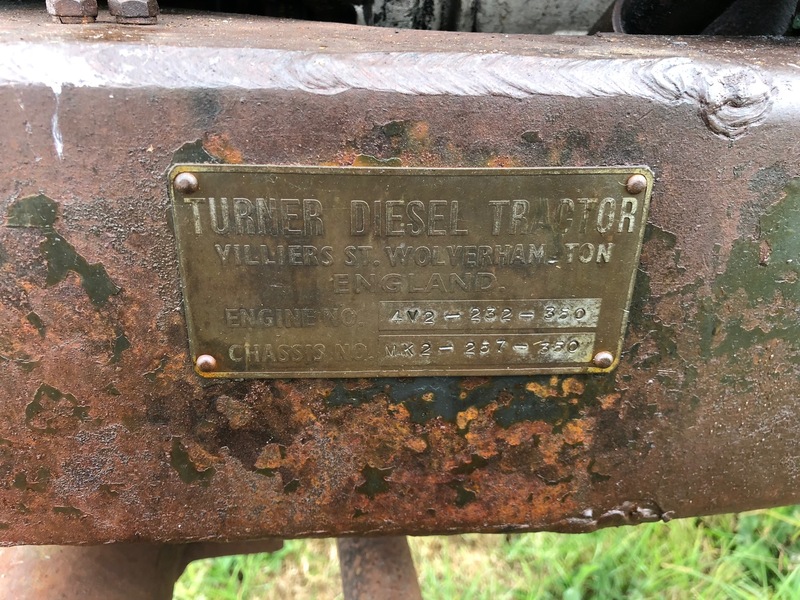 TURNER 'Yeoman of England' 4cylinder diesel TRACTOR Engine No. 4V3-1714 Serial No. 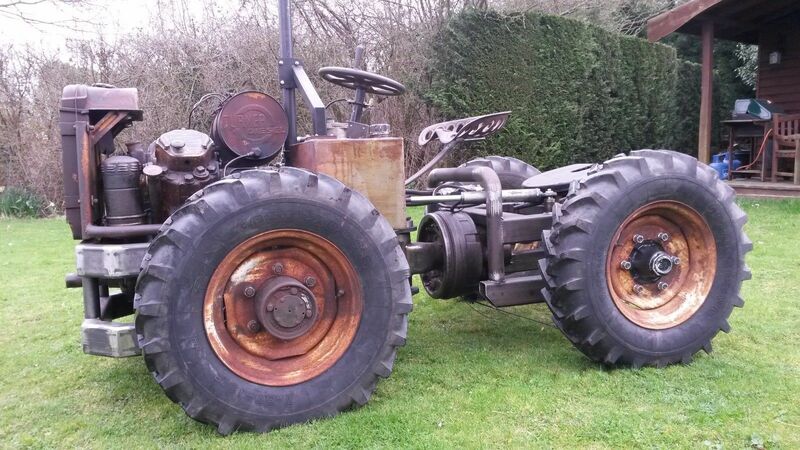 MK3-1700 Fitted with rear linkage, swinging drawbar, PTO on 11-36 rear and 6.00-10 front wheels and tyres. An older repainted example. - This was the 'blurb' in the Cheffins catalogue for their October 20th sale. It sold for £10,000 so with buyers premium and VAT came to £10,600. You don't see things like this come up too often. 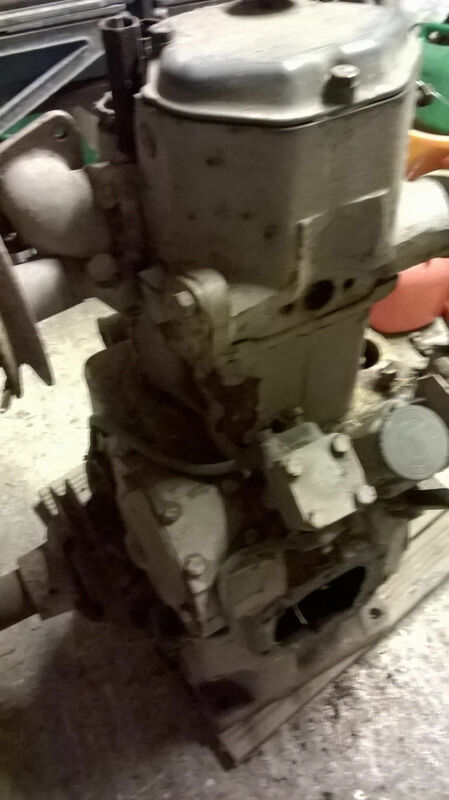 Clearly not a Turner item but it is of the type fitted to the 'V' twin generator supplied by Turners. 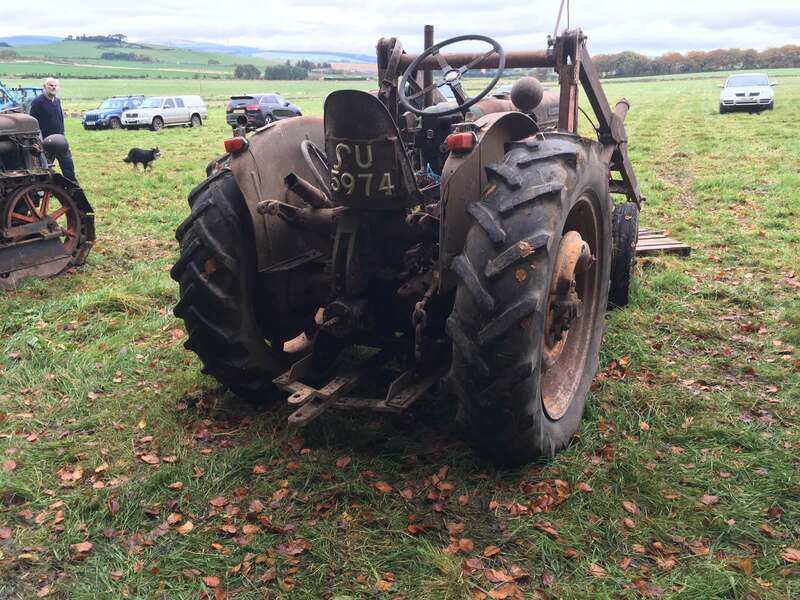 The 'V' twin engine out of this tractor is back up on eBay again (10th November 2018). 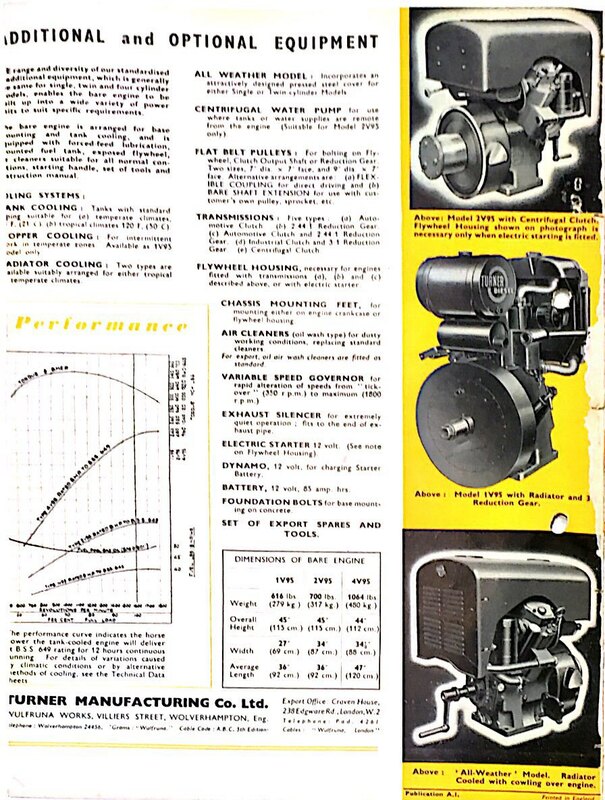 I've successfully managed to secure an advertising leaflet (8th October 2018) pertaining to Turner Industrial Engines that neither Larry or I was previously familiar with. These images taken from the actual document now it's arrived with me. Unfortunately the one edge has been trimmed so the left hand edge of p.4 is very slightly truncated. 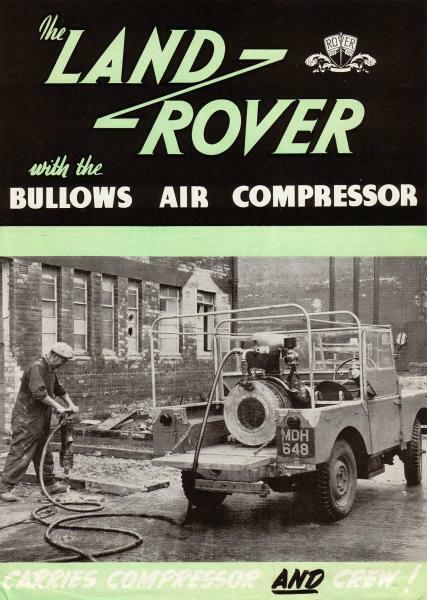 I have been seeking a Bullows SA2500 three stage compressor for a number of years now. 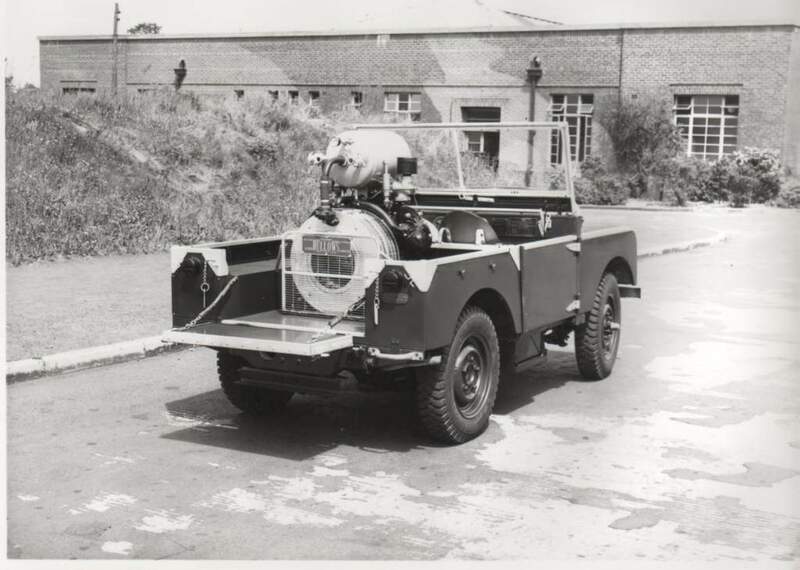 A number of 80" Land-Rovers were fitted out with these as per the pictures below. 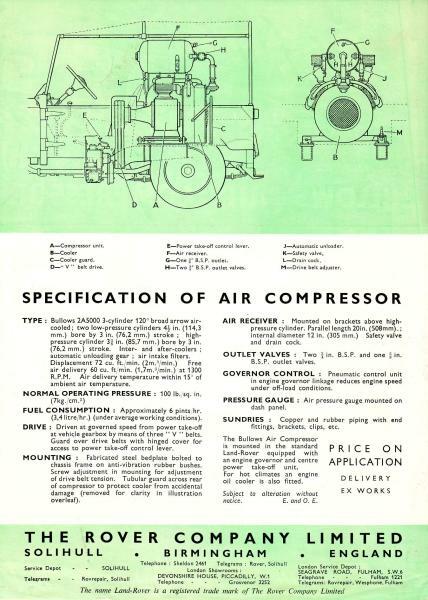 I would be very interested to hear from anybody who might have any information concerning such a compressor. 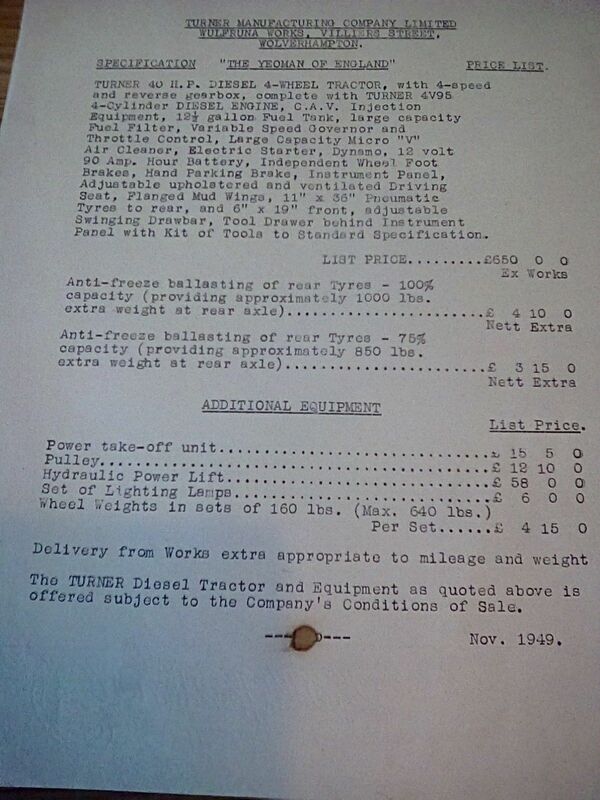 A slightly unusual item came up for sale on eBay recently (sold on 17th September 2018) by way of being a price list for Yeoman tractors back in 1949. I lifted a copy of the image and posted it here. Changing out dual gauge/ installing thermostat. August 25th 2018 - As noted elsewhere on the site having installed the dual gauge the other week I had 'forgotten' I actually had a 'proper' Series One pattern gauge lurking in a drawer. I also went out trawling for and found a couple of thermostats which were then duly tested in my high tech rig. I thought it would be a straight forward job installing the thermostat along with the other dual gauge but it wasn't to be. In the end I had to remove the whole manifold again as the end piece containing the thermostat simply wasn't going to come off easily. Having replaced the manifold and installing the boss/ adaptor used on the other manifold I then discovered that the 'correct' pattern dual gauge bulb was stepped or shouldered and wouldn't fit. Fortunately I had one remaining adaptor attached to an Land-Rover thermostat housing which was pressed into service. 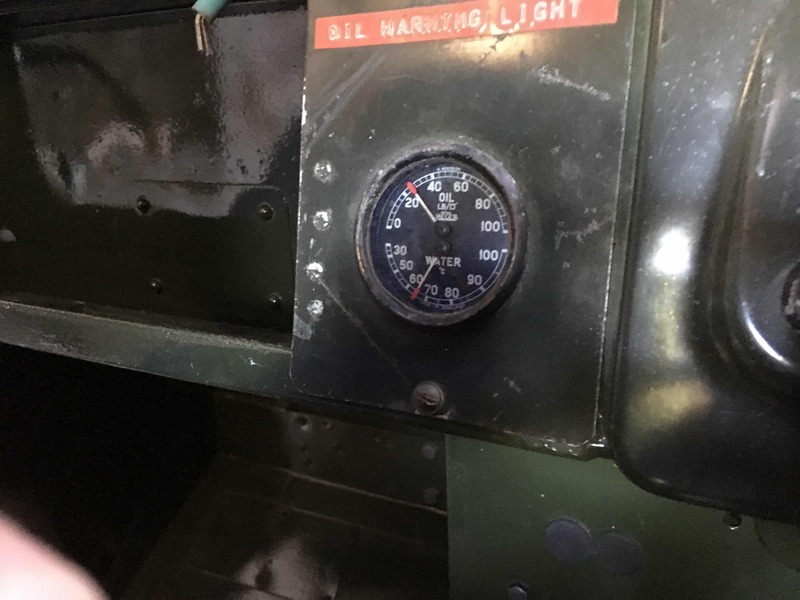 The replacement gauge in place and after a road run, engine at idle. 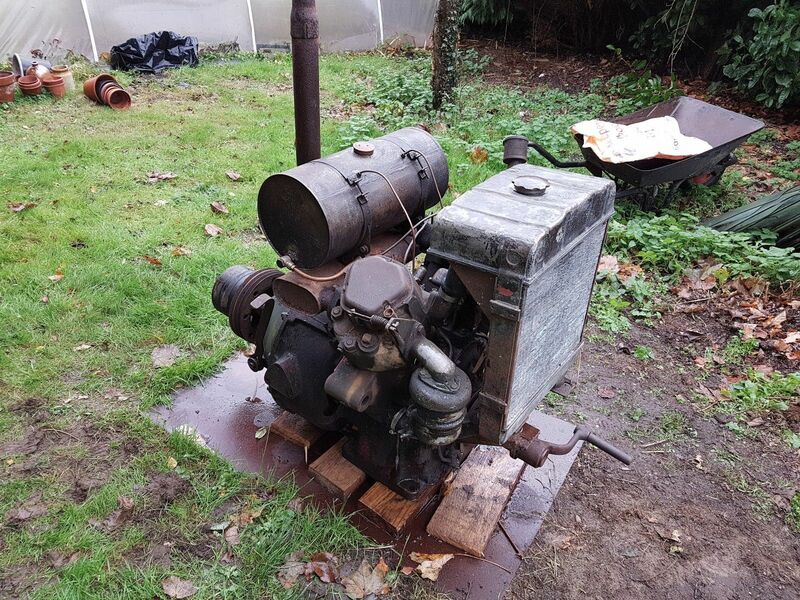 This engine was very recently advertised and sold (for £100) on eBay (2nd August 2018). 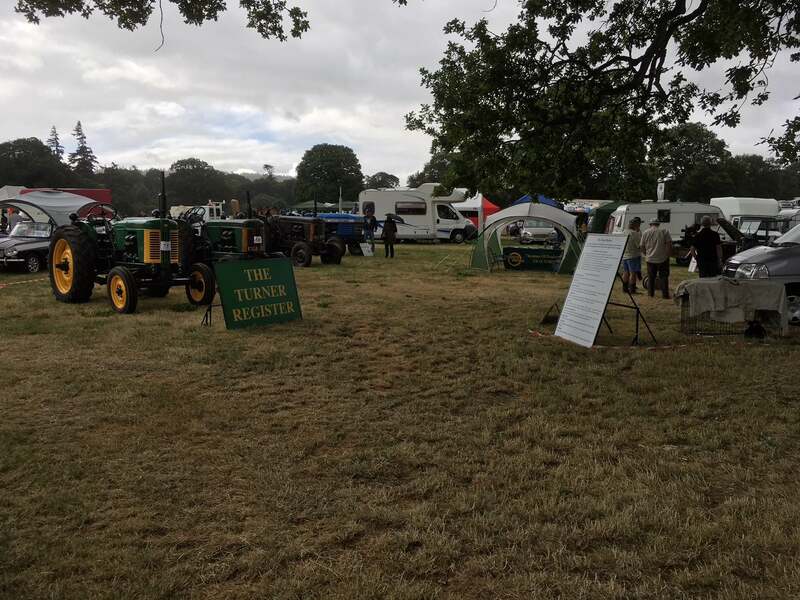 We were contacted by a guy on 28/07/18 who had visited a show in Somerset and seen the tractor below. Being unfamiliar with the make he looked it up and found our site. It is one 'we' know about but still we never know if an unknown one will turn up and clearly people can report their findings via our web site. 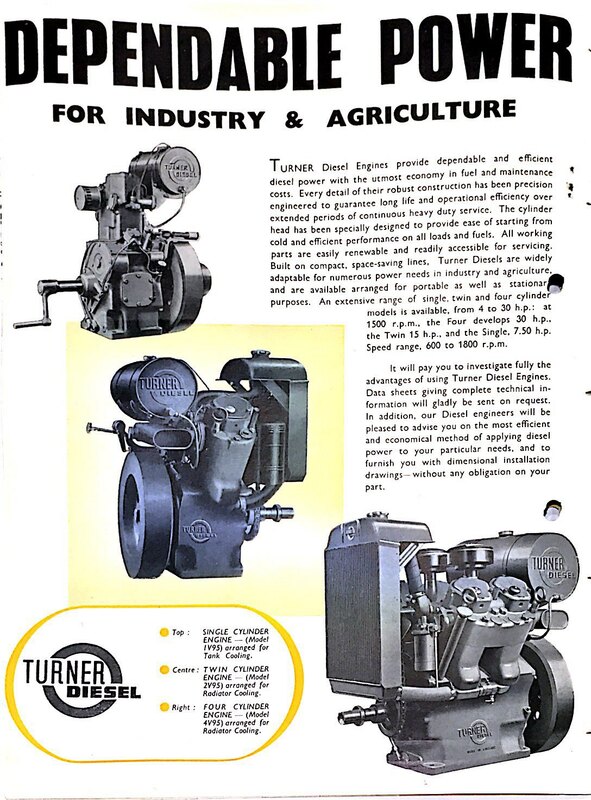 We are ALWAYS interested to hear of the sightings of any Turner Manufacturing Co. products. 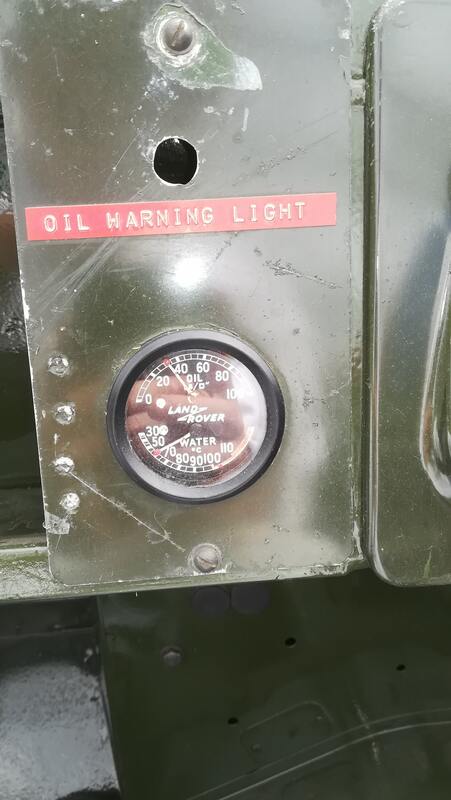 Having 'discovered' the water manifolds yesterday we swapped the one on the Land-Rover so the previously fitted dual gauge (water temperature/ oil pressure) is fully functional. We still need to tidy the routing of the capillary tube. We now need to consider putting a thermostat in to the system. On a couple of short runs over the last two days I've been aware of a loss of power under acceleration, I was imagining all manner of things. 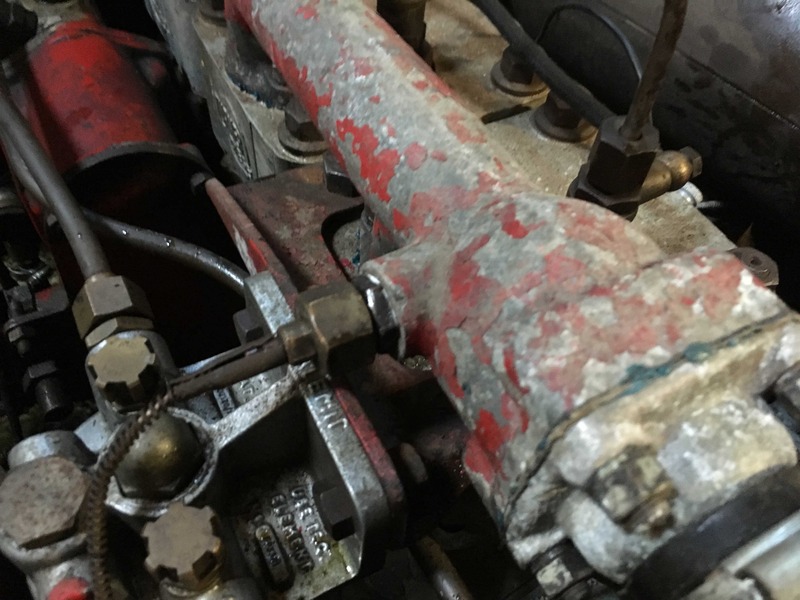 Having removed the bonnet to facilitate fitting the water manifold I noted that the manual fuel primer had become 'undone' and was leaking fuel but also allowing air into the fuel system. Having screwed it up the problem disappeared. 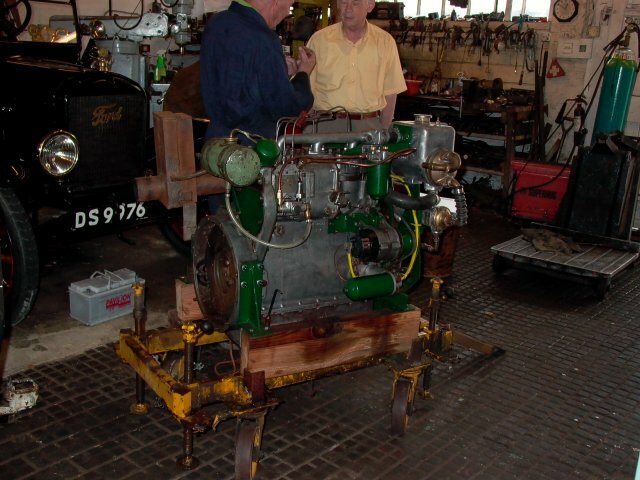 Having recovered from appearing down at Glamis I've been looking more closely at other engines I own. 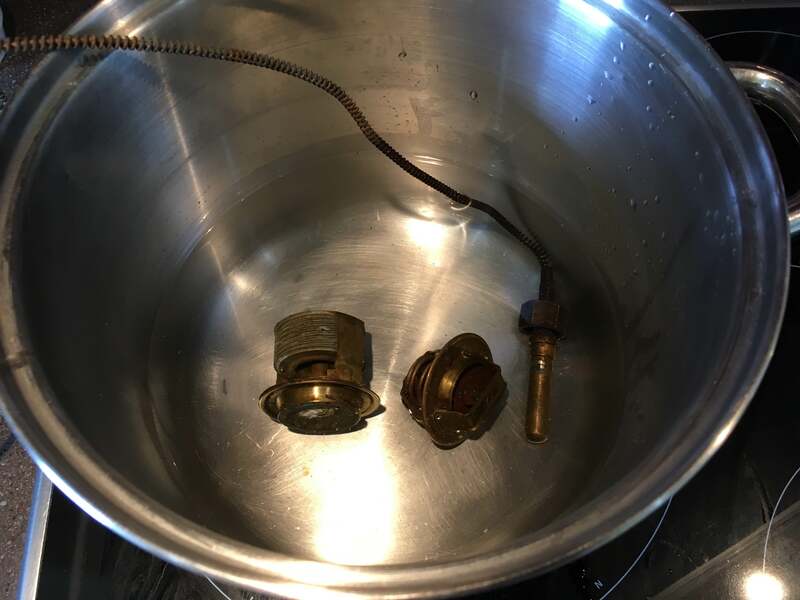 I did have a water temperature sensor fitted but this was disconnected for fear of reducing water flow. I have two 'marinised' L60's and both have a water manifold with a threaded boss fitted allowing for easy fitting of a sensor. I hadn't noticed this feature as both units have been boxed up since they arrived a number of years ago, it was only yesterday (Friday 13th July) that the boxes were broken into. 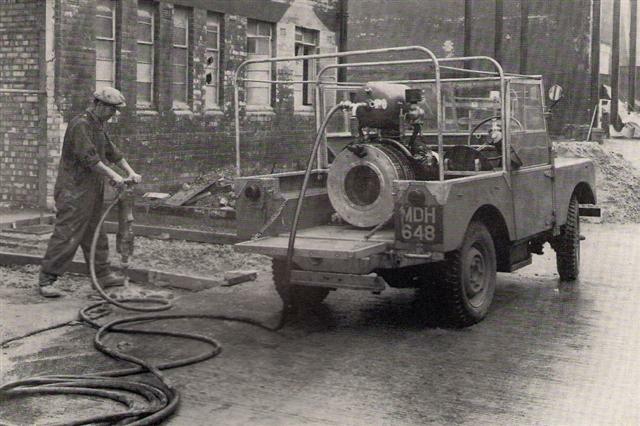 Both engines were fitted with the pre-engaged starter but only one had the original pull handle and Bowden cable fitted. 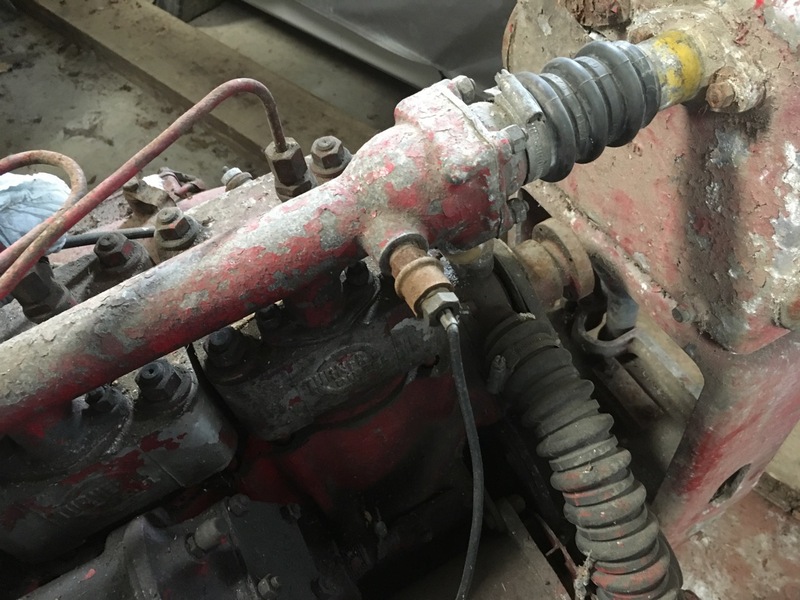 If you look carefully at the photo below you can follow the cable around from the pull handle in the upper right but also note the starter has an additional clamp fitted. 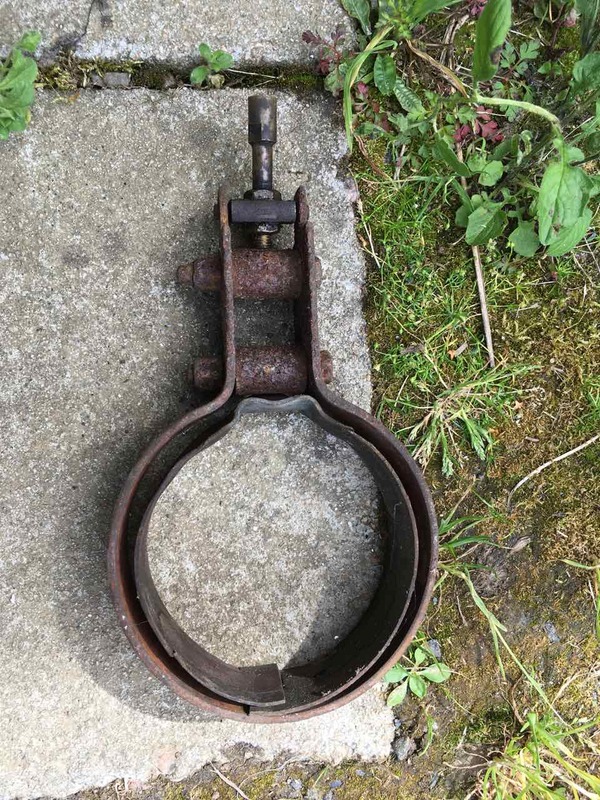 I had a root around there area where my Turner spares live and found one such clamp although I have no recollection of it. 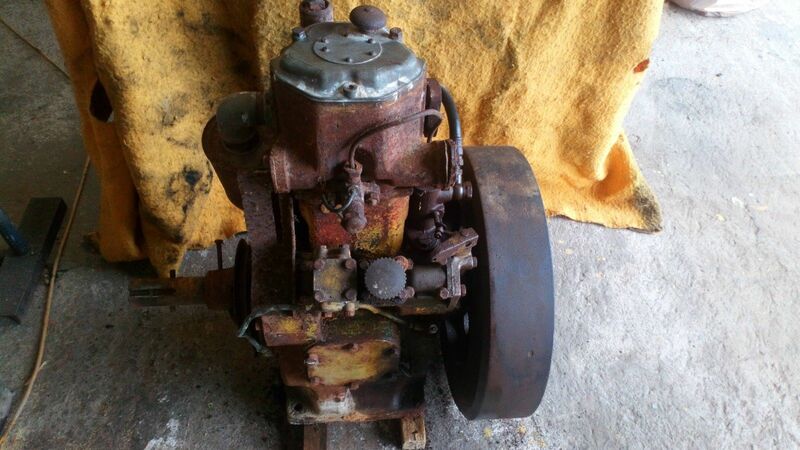 I will now look to fitting the correct starter at some point. 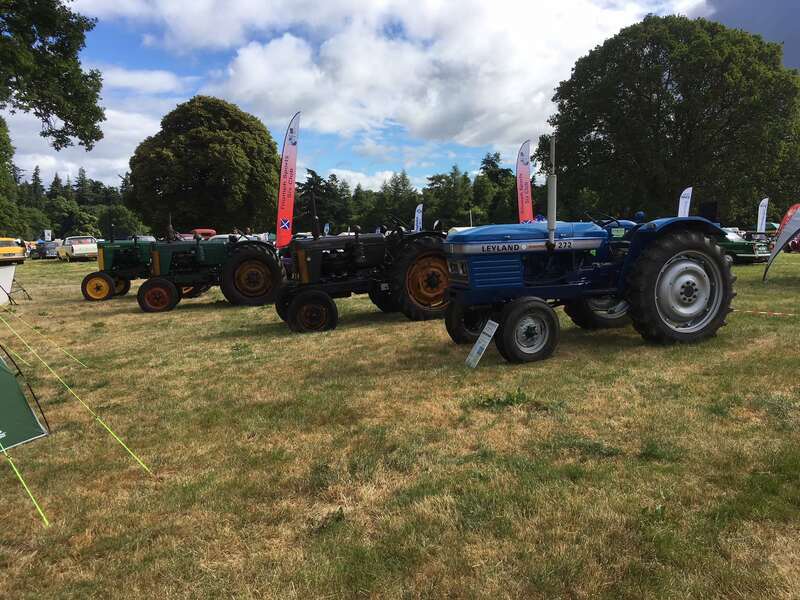 This last weekend saw the first display stand, by Bob Laurie's Turner Register, at the Glamis show. On hand throughout the weekend were Bob Laurie, Larry Hopkins, Glyn Beach and myself. Items on display were a restored Yeoman, two 'waiting to be restored' Yeomans, a Leyland fitted with a Turner synchro box, a 2V95 driving a couple of Turner winches, a marine 2V95, a recently acquired 1V95 coupled to a generator, my Turner engined Land-Rover, Turner Bray outboard and Turner vacuum pump. Numerous people stopped by the stand over the weekend, which enjoyed glorious weather. Hopefully this will be come a regular stand at this event. 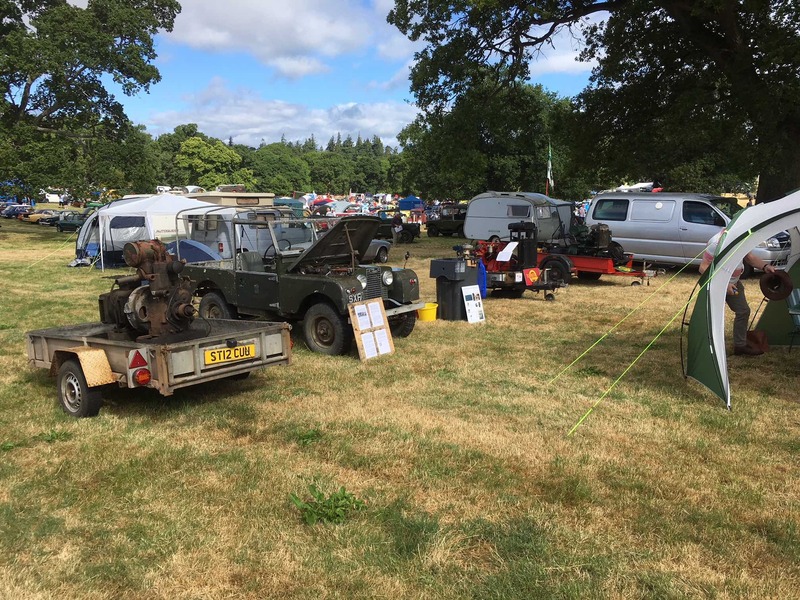 Thanks are due to Bob Laurie for staging this and the obvious expense involved in providing the stand ancillaries and the very welcome refreshments. 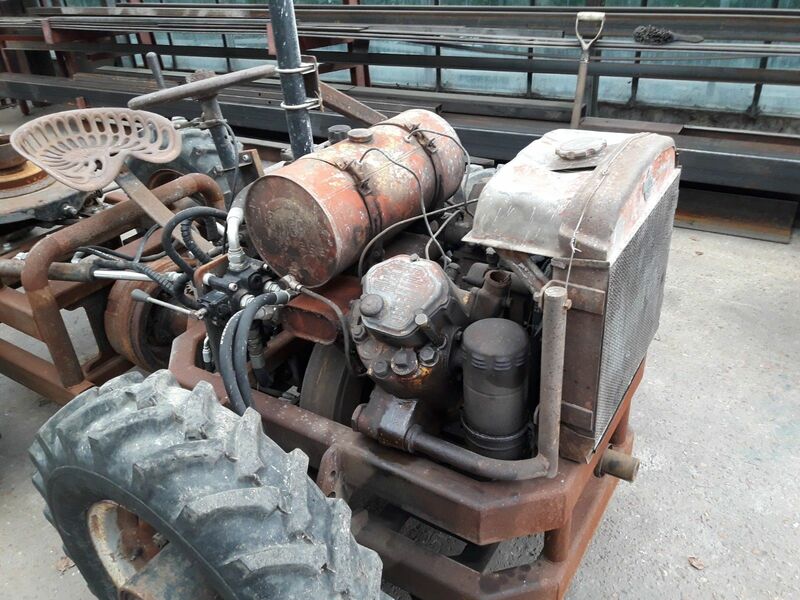 June 2018 I have been advised of a "surviving" Turner tractor, serial number 1356 a 1952 MK3, in Turkey that may be for sale. 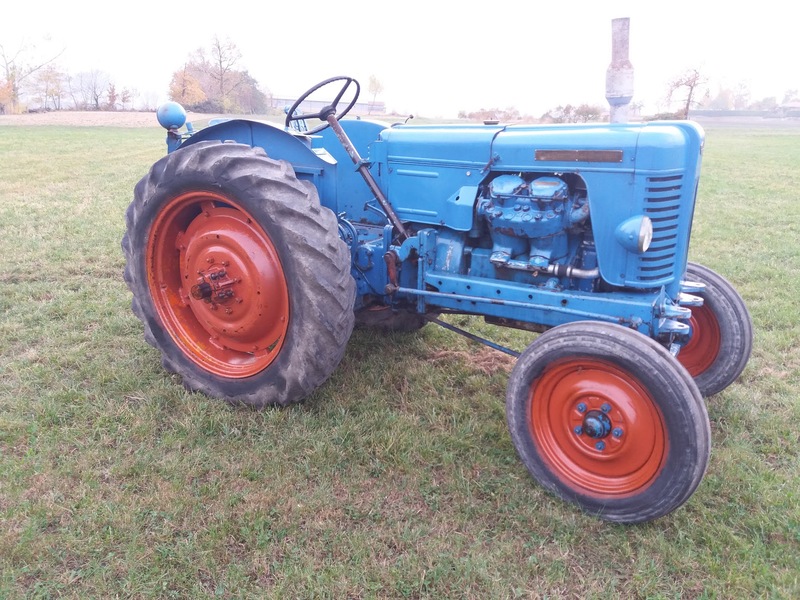 This tractor has come up for sale on eBay recently (I believe it is an October 1951 built MK3). This was sold to somebody in the Cambridge area. I've just come across this picture whilst going through some CD-ROM's of assorted stuff we've taken off old computer HDD's. I honestly can't recall ever seeing this picture before. If anybody knows who the owner is, or if you are the owner, can you please get in contact? 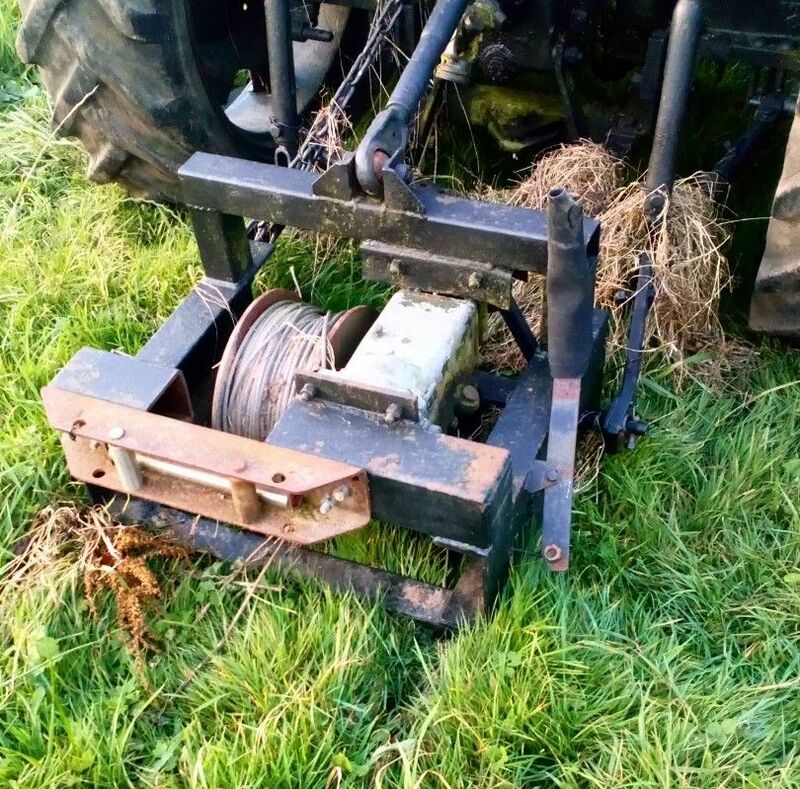 The winch, as featured in the picture has just come up for sale on eBay (13th November 2017). 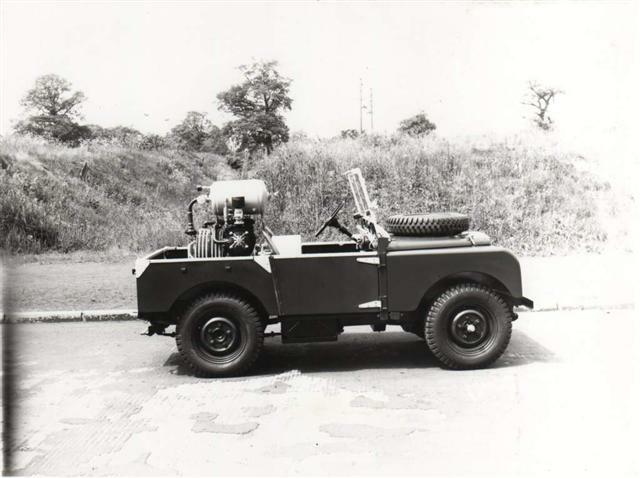 It is an FV1600 as originally supplied for fitting to the Humber so isn't actually a Land-Rover unit. This was sold. 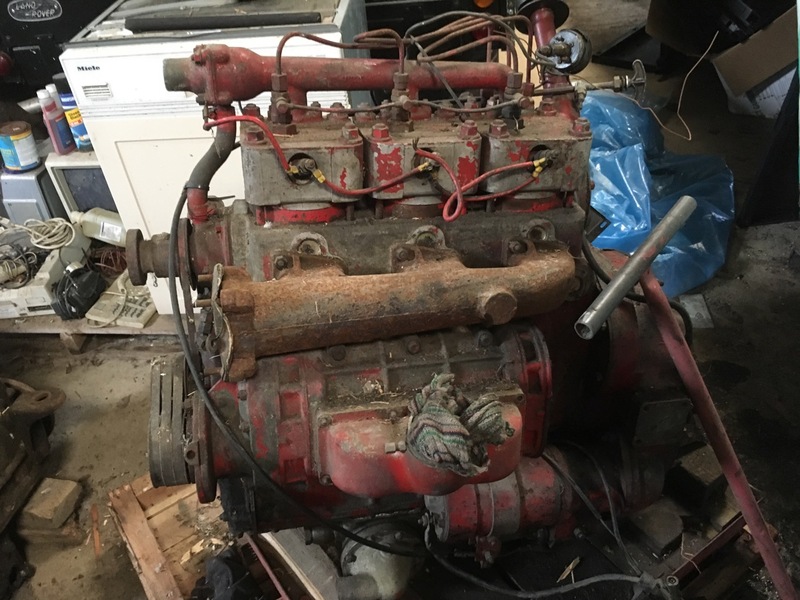 This engine came up for sale on 12th November 2017. 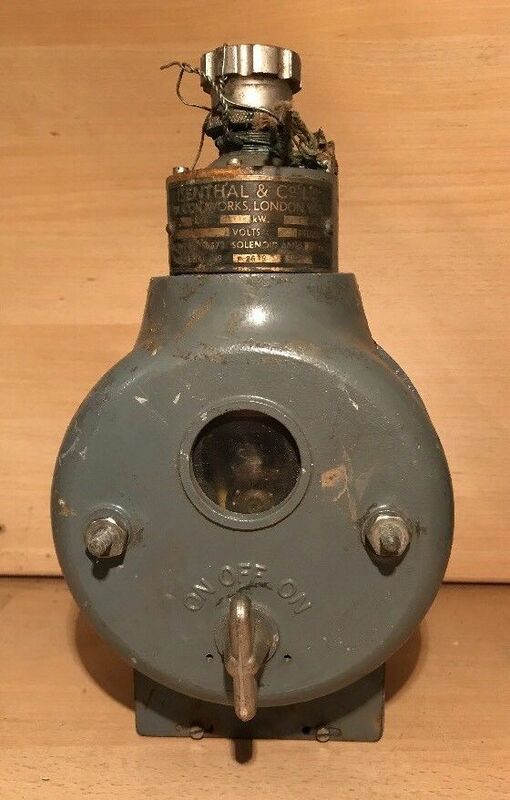 This unit has just been re-advertised on eBay (May 2018). 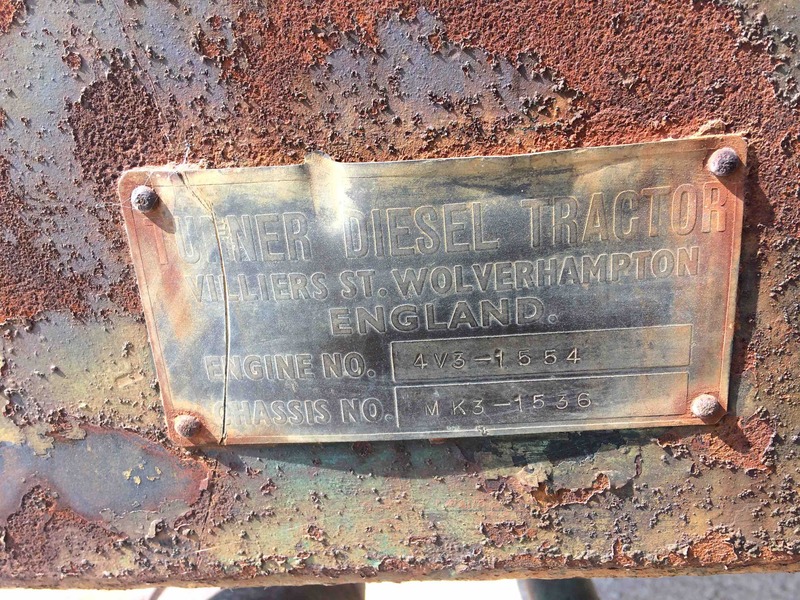 As I type this on 10th November 2017 this engine is at £545 with 11bids so far. It seems slightly odd to see a breather on the oil filler tube and the radiator badge is absent but other wise looks OK. Sold - buyer unknown. 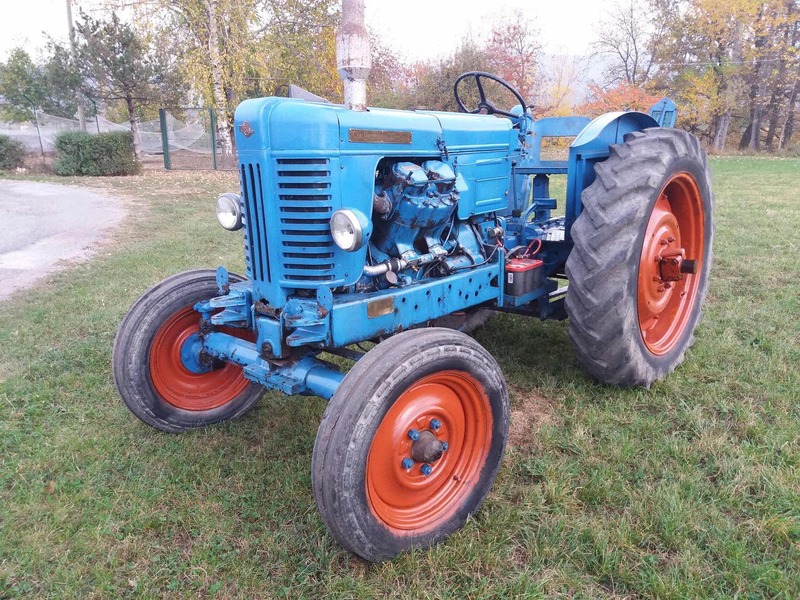 The vendor of this tractor lives in Northern Italy but is willing to include delivery to the UK in the sale price. 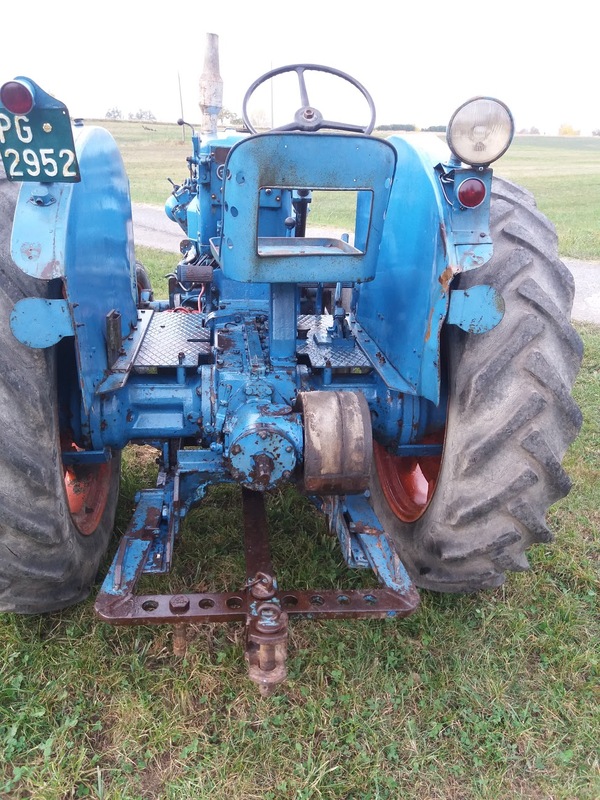 The tractor is described as being in great mechanical condition as it has done little work during it's lifetime. 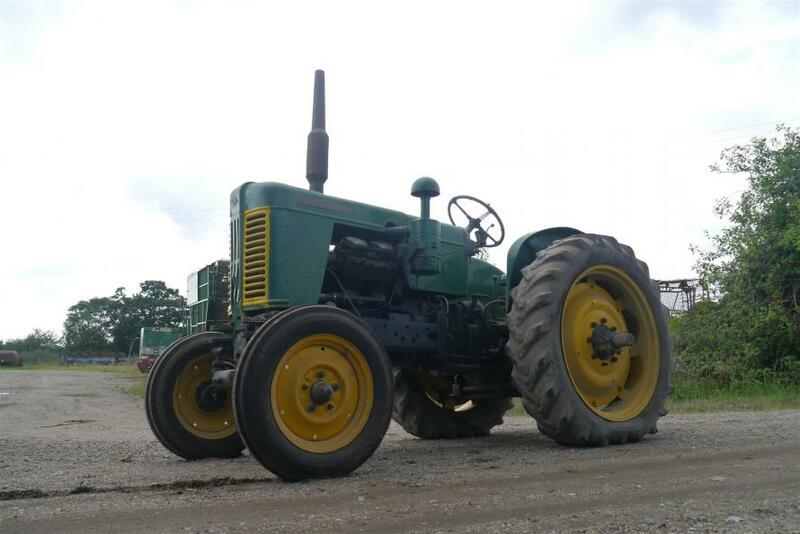 It was originally sold for use on a threshing mill but was replaced with a Nuffield tractor. There is little wear on the platform, pedals and hitch. It starts easily and the brakes, clutch and gearbox are all in full working order. It is fitted with the PTO & belt pulley unit and a basic drawbar. 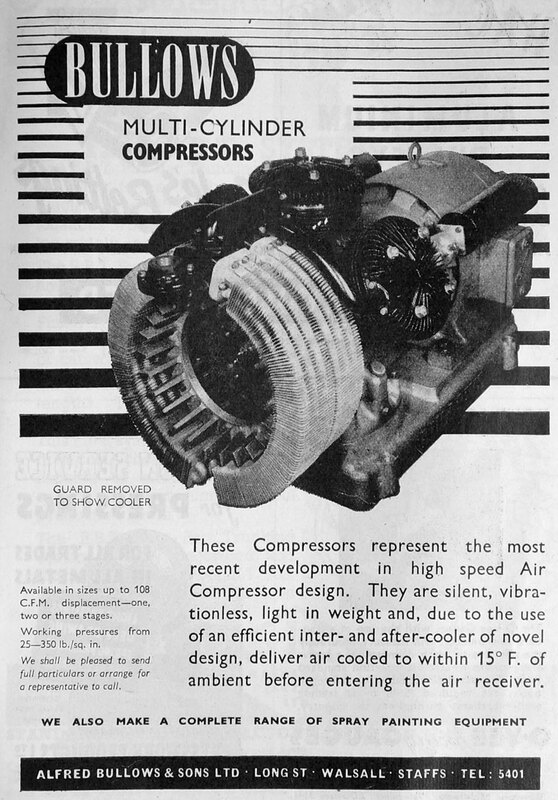 It has its original engine. It is understood that the normal Turner colours were replaced by the single shade of blue as can be seen in the photographs at the point of sale. 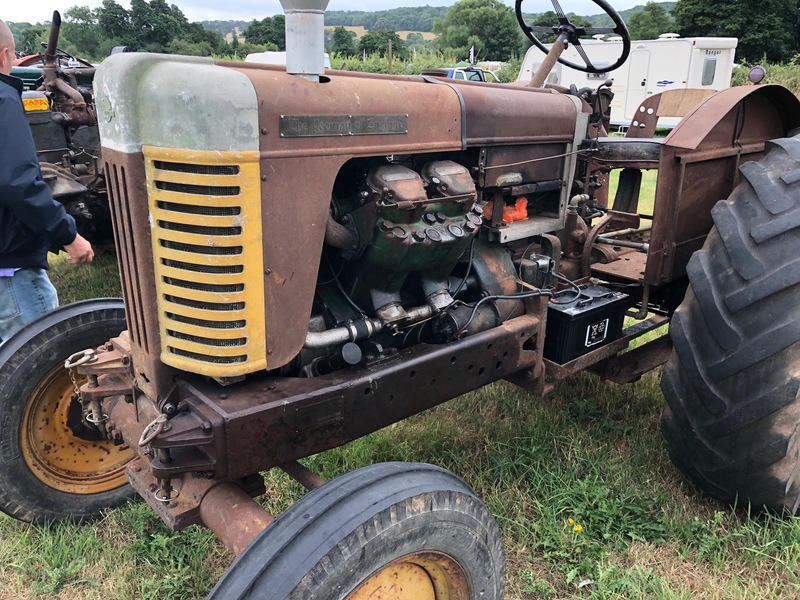 The vendor's father bought the tractor from the original purchaser in the 1980’s. 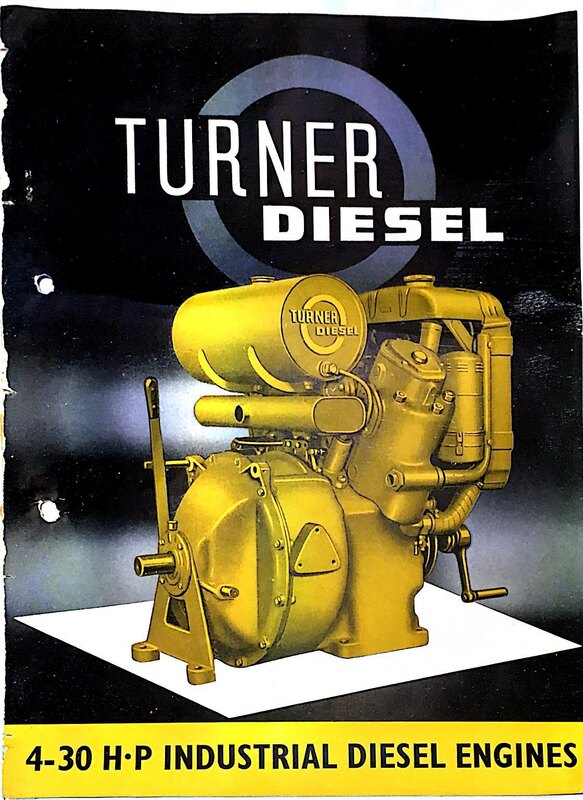 The Turner tractors were imported into Italy by Selene who are better known for their 4WD conversions of various makes of British built tractors. The sales agent was a Nuffield dealer and eight Turners were sold into the Piedmont region if Italy. The status of four of those is unknown. One has already been imported into the UK possibly around 2006 but its current ownership details are unknown. One was exported to a dealer in the Netherlands and has been sold on with no further details available. One is retained in a private collection in Italy. 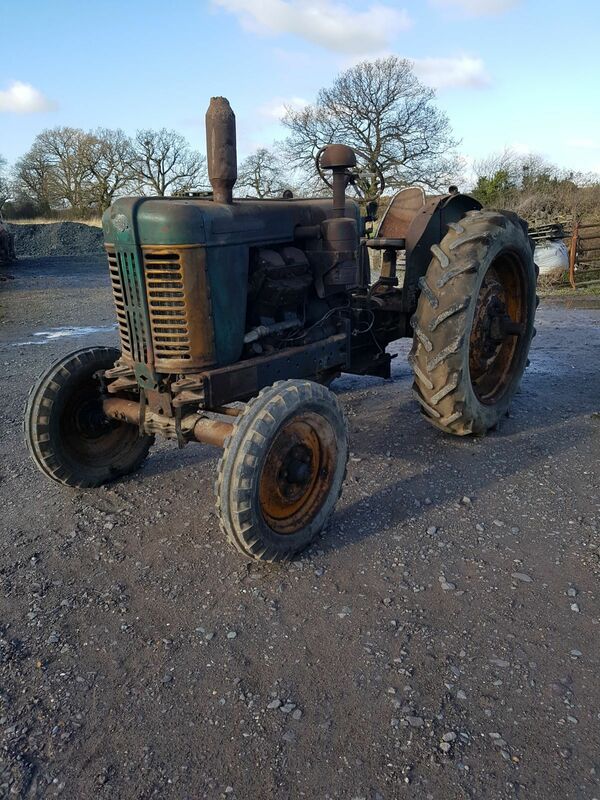 Could anyone interested in purchasing this tractor please get in touch via the email link on Home Page of this web site. Please note the vehicle is to be sold without the Italian registration and plate. This vehicle was bought by a Belgian dealer. I've been contacted by the son of former Turner employee who may have some photo's and also an Italian tractor collector in the last 48hrs (21st October 2017). More in due course. 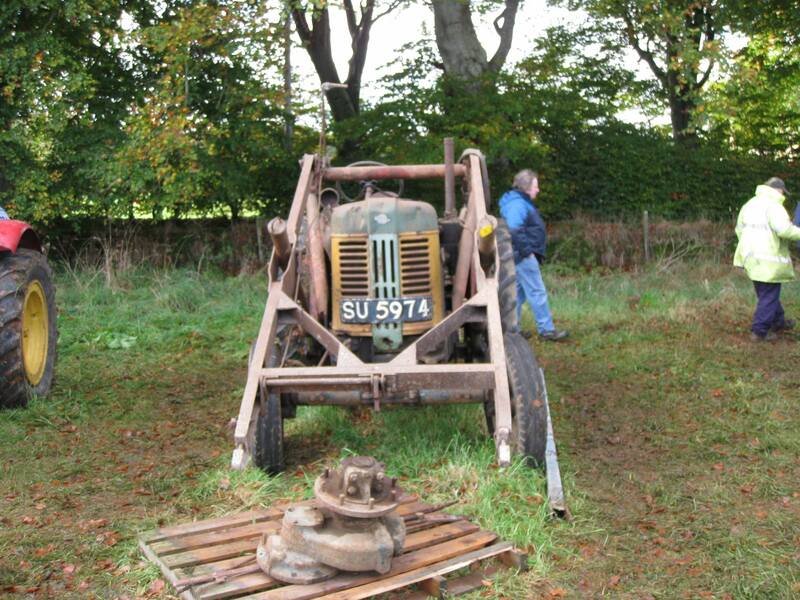 A Mk2B Turner Yeoman was sold today (21st July 2017) at a displenishment sale outside Insch, Aberdeenshire. 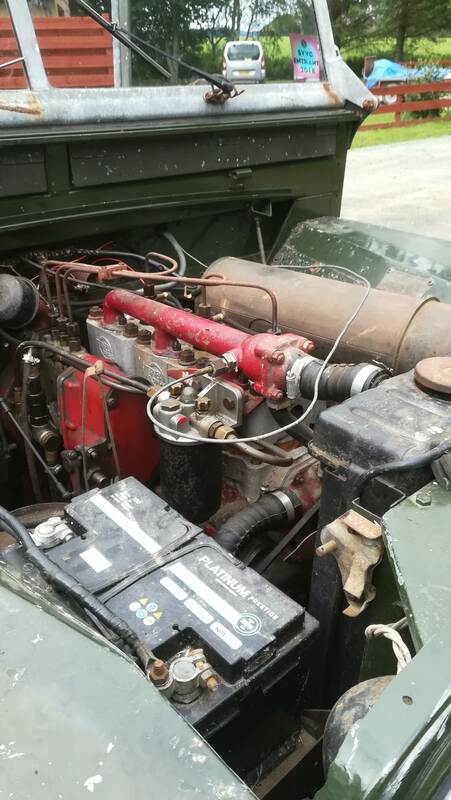 The actual running condition was unknown (the buyer has since advised that the engine did run but at a very high speed) and it was fitted with a front loader. Despite taking several pictures they were all close-up detail type so the only overview I have was one from the rear but courtesy of Larry Hopkins I also have the one from the front.